The months of July and August brought the National Women’s Hockey League their first free agency experience. Each team was allowed to sign 18 players and roster spots quickly began to fill up. Although all spots have been filled not all the players have been announced as to give some of the players time to be released from their contracts with other teams. Who are the lucky beauties who signed with the Buffalo Beauts during free agency? Some of the girls have ties to RIT. A few are no stranger to the Olympic stage. Two of the Beauts have played on all male teams. One Beaut calls Buffalo her home. Zach had a rather promising start to her career at RIT. During her first season with the squad she scored 12 goals and 6 assists over the course of 25 games. Over the course of the season Zach was named ECAC West player of the Week and RIT Female Athlete of the Week. Sophomore was a bit slower for Zach as she tallied 6 goals and 8 assists over 27 games. Zach had a much better junior year. She led the team with 2 shorties and 113 shots on goal. Zach also had the honor of being named to the CHA All-American Team. By the time senior year rolled around Zach was a standout on the team. She was second the team with 25 points and 127 shots on goal. Zach’s six power play goals placed her in a tie for 1st on the team. She was also named RIT’s Female Athlete of the Week. Skeats spent 5 years at Laurier College where she scored 42 goals and 45 assists over 117 games. While there she helped Laurier win three championships (2010, 2012, 2014). During the 2014-15 season she played for the Neuburg Highlanders who placed third in the Austrian Cup. She also played for an Austrian men’s league team called the Bulls. The Bulls finished the season second in the league. By the time Browne started at Mercyhurst in the fall of 2011 she had earned two silver medals. The first in January 2011 with Team Canada’s U-18 team at the IIHF U-18 Women’s World Championship. The second in February 2011 with Team Ontario at Canada’s Winter Games. While at Mercyhurst she was named College Hockey America Rookie of the week and had 5 points over 34 games. Zach transferred to Maine at the beginning of her sophomore season. She played 96 games scoring 12 goals and 21 assists. Rafter played 5 seasons for the University of British Columbia scoring 61 goals and 55 assists. She also has a gold medal under her belt from Canada’s win at the 2013 Winter Universiade. Bram is a hard hitting defensive forward hailing from Mercyhurst University. She started her career of with a bang scoring 7 goals and 14 assists over 32 games. Bram also finished with a +19. At the end of Bram’s sophomore season she was named to the All-CHA First Team. She would also finishing 5th in assists (27) in the College Hockey America Conference. Based on her 35 points, +20 rating, and the ability to keep the opponent from crossing the blue line, Bram was awarded the College Hockey America Best Defensive Forward award her junior year. Wearing the moniker of assistant captain Bram kept things rolling her senior season. She was 3rd on the team with goals (8), 6th on the team with assists (14), and 5th on the team with points (22). While playing for Miami this past season, Williams placed 3rd in the nation with 27 goals and 26 assists. Even though Williams has one year of eligibility left she opted to turn pro and play for the Beauts. Kunichika started her time at RIT by making a name for herself almost immediately by scoring 8 points over her first 4 games. Her 15 goals and 28 assists placed her 3rd nationally and 1st among all first year players in scoring. During Kunichika’s freshman season she also helped RIT win their first championship by scoring the game winning power play goal over Pitt. Scoring the championship winner wasn’t the only good thing she did during the tournament. Kunichika set the NCAA Championship record for most points in one tournament (10) and the most points in one game (6). She also had her first hattrick during RIT’s 10-1 massacre of Adrian during the Quarterfinals. Kunichika opened the sophomore season with 22 points over 11 games. She would finish the season with 20 goals, 25 assists, and a plethora of accolades ranging from NCAA All-Tournament Team to ECAC West All-Academic Team. During junior year Kunichika scored her 100th point and was 2nd on RIT with 193 faceoff wins. She won 51.2% of her draws. Senior year brought Kunichika’s 100th career game. She finished the season with 10 goals and 14 assists over 37 games. 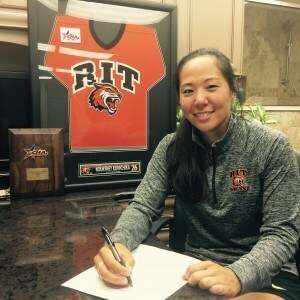 By the end of Kunichika’s collegiate career her name was etched in the RIT record books. She currently holds the record for post season play with 11 goals, 13 assists, and 17 post season games. Kunichika also holds 2nd for power play goals (24), 7th for goals (54), 4th for assists (82), and 4th for points (136). Over the five seasons Fickel played for Brock University she appeared in 114 games scoring 51 goals and 62 assists. Her 113 career points made Fickel the all-time points leader at Brock. This past season the team retired Fickel’s jersey. Grigg was on the top defensive unit that only allowed one goal per game her freshman year. By the time sophomore year rolled around Grigg was playing both as a defenseman and a forward. Grigg continued to play both ways her junior year. She led all defensemen in points (21) at RIT and currently holds the school record for blocked shots in a season (127). Senior year brought 7 goals and 11 assists over 39 games for Grigg. Those 18 points placed her as the leader of the team in scoring. Grigg was also the team leader of blocked shots (77) and faceoff wins percentage (52.7%). In McDonald’s first year playing on the blue line for Maine she tallied 3 assists over the course of 34 games. Her pure defensive style led her to be named the 2010-11 Rising Star. McDonald was also named to the Hockey East All-Academic Team that year. During McDonald’s sophomore year she racked up 3 goals and 3 assists over 34 games. She also blocked 15 shots and had a +14 rating. McDonald upped her game junior year scoring 8 points (1 goal, 7 assist) over all 33 games. Her consistent style of play and work ethic led to McDonald becoming Maine’s captain her senior year. She would lead the team with 7 assists. Harrington played for UMass Amherst from 2011-15. While there she helped lead the team to two ECWHL Conference Wins (2012, 2015). Although Harrington was a solid player for most of her career senior year was the best. She co-captained the team and was UMass’ Defensive MVP. Harrington also scored the most goals by an ACHA defenseman. 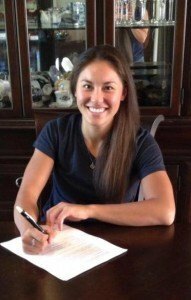 McLaughlin was the first player the Beauts scooped up during free agency. 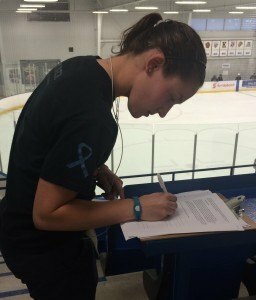 She is one of the most recognizable and decorated players on the Buffalo Beauts, if not the entire league. She quickly became a household name during her four years with Robert Morris University. McLaughlin’s accolades ranged from CHA Defensive Player of the Week to First Team All-CHA Honors. She currently holds the NCAA record for career saves (3,809). McLaughlin has 6 medals under her belt. Two of which game from the 2010 and 2014 Olympics. Hometown girl, Sass, is no stranger to having to be a rough and tough goalie. She spent her high school years playing for the boys’ team at her high school Willamsville North. Sass went on to play four years at Colgate where she won 34 career games. She currently holds the program record for most minutes played in a season. Makela had a slow start to her collegiate career and didn’t play much until her sophomore year. Once sophomore year rolled around she started 15 games and shut out the opponent four times. She was 3rd in the CHA winning 63.3% of games and 4th in the CHA with 2.01 goals against average. By junior year the whole country started turning their eyes towards Makela. She finished the year 5th in the country with shutouts (6), 13th in the country for goals against average (1.87), and 7th in the country for win percentage (70.6%). Makela also assisted one goal. Makela started her senior season with 3 consecutive shutouts. She would finish the season with 8 shutouts and was named the 2015 College Hockey America Goaltender of the year.